Re-Start Jalopy Records! Lost Train Blues! Please help us out by supporting the Kickstarter fundraising campaign! Before November 13th!! Brooklyn’s Jalopy Records has rebooted their homegrown folk music record label with a brand new release, “Lost Train Blues: John & Alan Lomax and the Early Folk Music Collections at the Library of Congress.” Help us produce and manufacture this album AND get the ball rolling on a bright, new future for the Jalopy Records label! Jalopy Records has partnered with well known Oregon based vinyl label Mississippi Records to manufacture and distribute this and future releases. Jalopy Records is the record label of the Jalopy Theatre and School of Music, a grass roots cultural center for traditional music, located in Red Hook, Brooklyn. The record features 22 selections from the vast holdings of the American Folklife Center at the Library of Congress, 13 of them have never been issued before. The record includes work songs, ballads, blues, political and union songs, guitar, banjo and fiddle music and Native American vocal music. These recordings were made between 1933 and 1950 and represent the birth of the folk music collections at the Library of Congress, now the largest repository of folk and enthographic holdings in the world. The record demonstrates the groundbreaking work of Alan Lomax and his father John Lomax, but also places them with the context of other important early field workers. The deluxe record includes liner notes by Alan Lomax archive curator Nathan Salsburg, as well as a 14 page booklet with photographs and original research about each song, artist and folklorist. The cover features an original lithograph by artist Jeff Tocci. Each selection has been retransferred from original discs and tapes at the Library of Congress and has been carefully remastered by sound engineer Don Fierro making for the best possible audio fidelity. 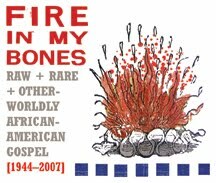 Here’s some preview tracks from the new Tompkins Square Records release, “Fire In My Bones,” a really amazing gospel compilation.